I am truly honored and excited to be the Falcon Zone Superintendent! 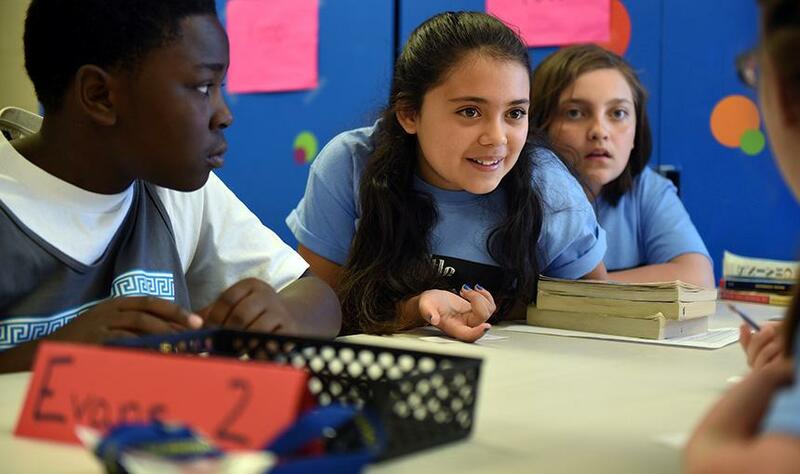 The zone’s firm foundation of tradition intertwined with innovation provides a great springboard for us to continue to learn, work, and lead and truly be a strong piece of the district’s focus on being the best choice in education. 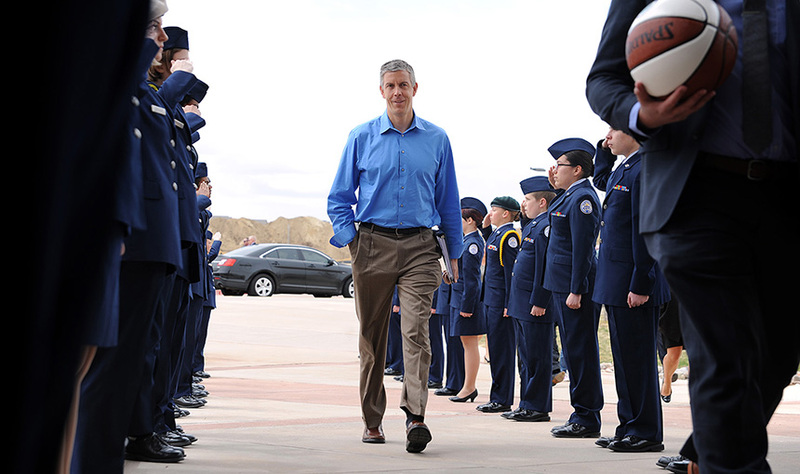 From my early roots of teaching secondary English/Language Arts, I always desired to ensure that ALL students were provided the best education possible. This yearning eventually launched me into school leadership spanning from assistant principal to superintendent roles. My leadership work began in a neighboring rural district to D49, and I’m so pleased to return to the eastern side of the Pikes Peak region—it really is like coming back home. I completed my undergraduate degree from Trinity University in San Antonio and my Masters Degree in Curriculum and Instruction with a focus on Educational Leadership from UCCS. My passion continues to be impacting students in phenomenal ways through working with and coaching building principals. My vision for Falcon Zone is to better engage students in innovative and meaningful learning so they are prepared for successful careers and lives in a world we can’t yet imagine! With a heart for relationship building and growth, I embrace partnering with staff, students, parents, and the Falcon Zone community to achieve the greatness each of our students deserves! Matthew Wentz, FHS class of 2015 salutatorian, was presented with an appointment to the United States Military Academy West Point during the annual ceremony. 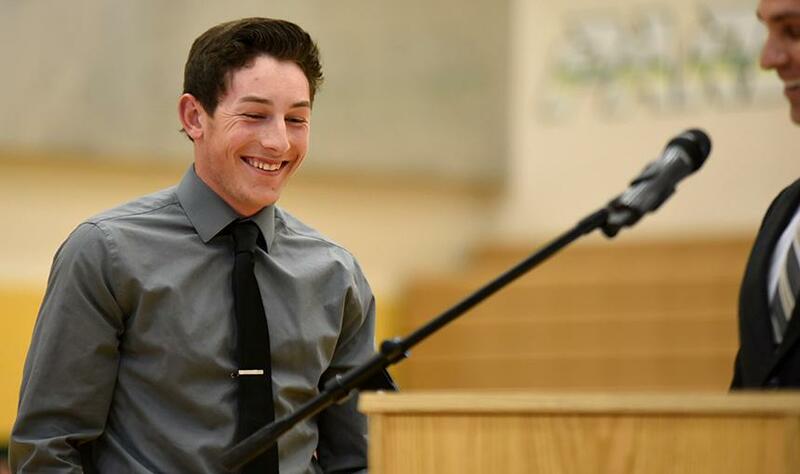 Wentz was also honored with a Coca-Cola scholarship, recognition from the American Chemical Society and named as outstanding senior student by the FHS business department May 5. 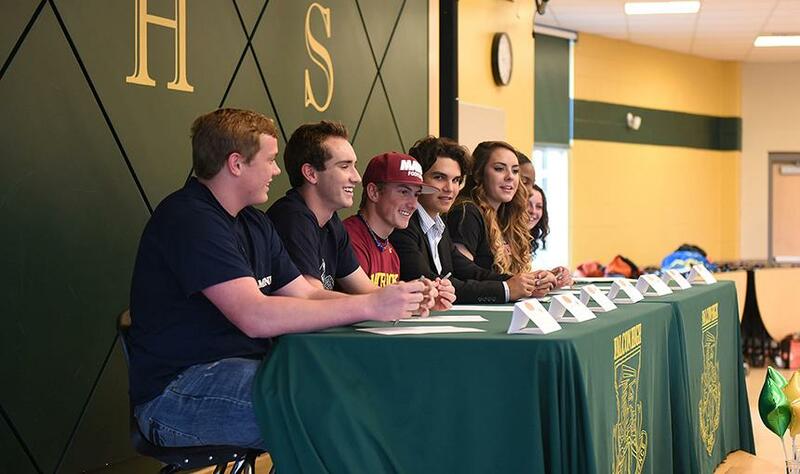 Twelfth-grade student athletes signed letters of intent May 5 at Falcon High School. "I would really like to thank the Falcon Education Foundation for the opportunity and the huge grant that they awarded our school," said Paula Hinson, WHES project based learning instructor and GT coordinator. 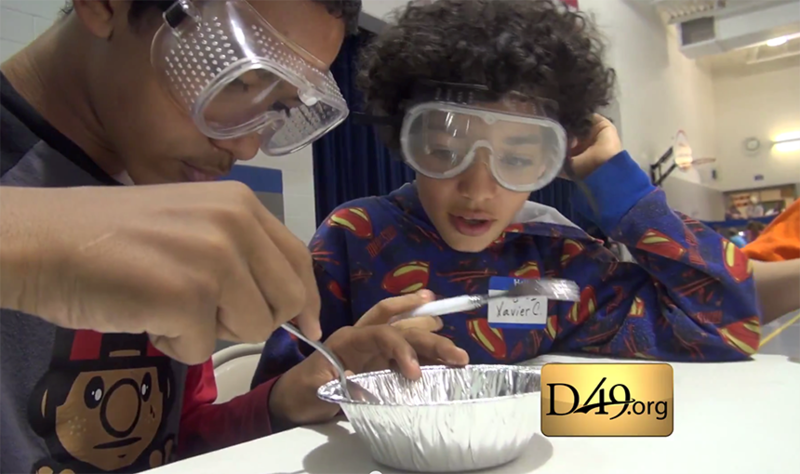 "The impact of that grant on what these kids are learning is huge." 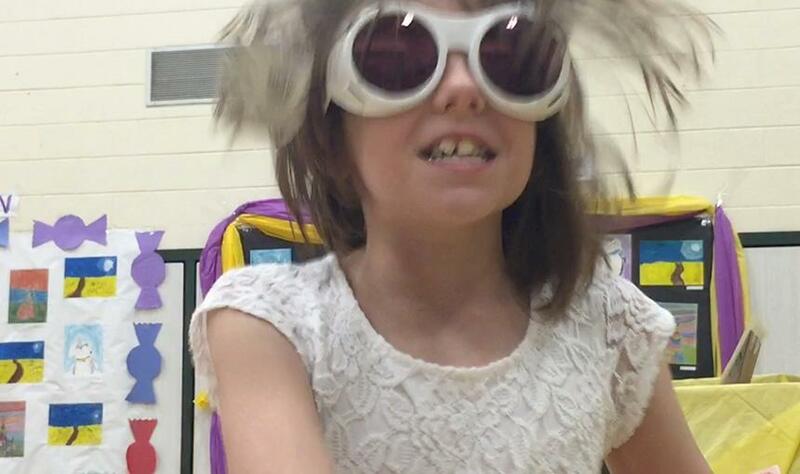 "One book, one school," a major initiative of Falcon Elementary School of Technology during the spring semester culminated with a school wide viewing of Willy Wonka and the Chocolate Factory on April 23. More than 300 students and family members attended the event, a celebration for parents, teachers, staff and students all reading the book Charlie and the Chocolate Factory. 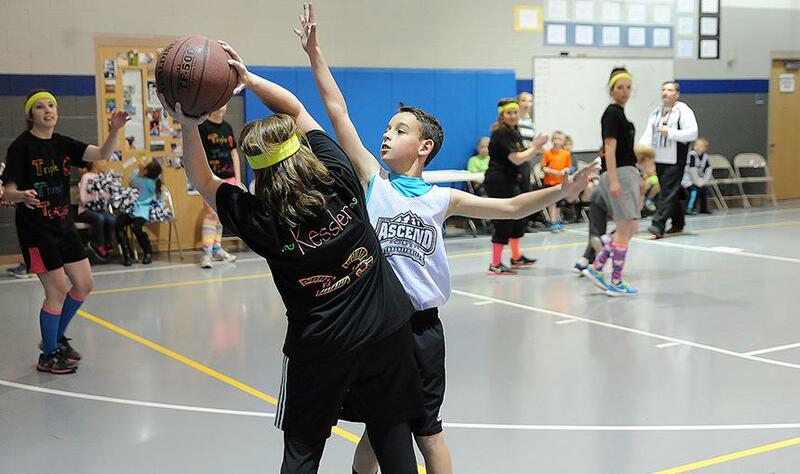 Fourth-grader Conner Ury, 10 competes against teacher Katherine Kessler March 19 during a student teacher basketball game. 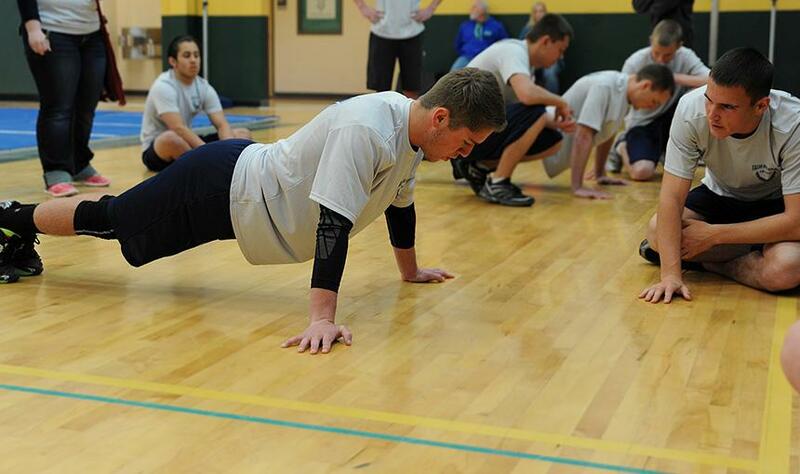 Twelfth-grader Jeffrey Brosious, 17, performs push-ups during the JROTC Physical Training Competition March 14 hosted by Falcon High School. 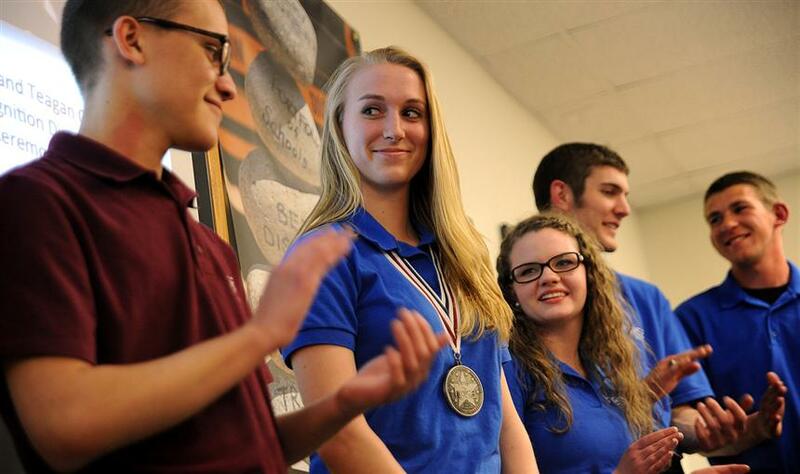 Eleventh-grader Rileigh Jones, 16, of Falcon High School explains how she earned a Presidential Volunteer Service Award during “Fantastic 49” recognition March 12, ahead of a monthly Board of Education meeting in District 49. 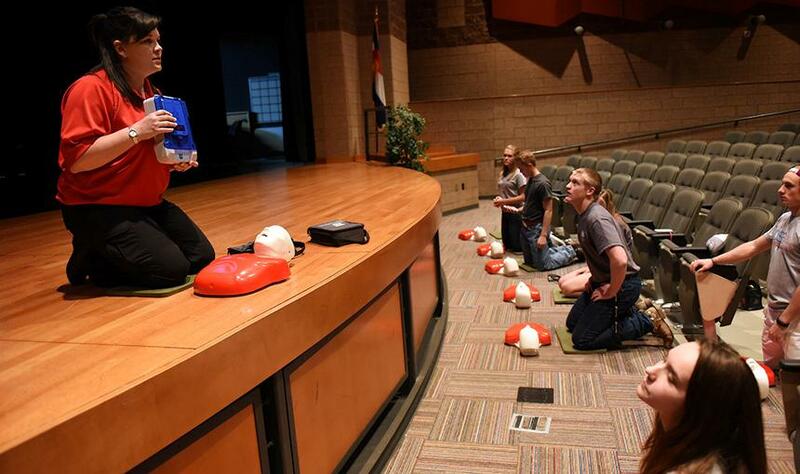 Meridith Jensen, a dispatcher and trainer for the El Paso Teller County E-911 Authority, explains how to use an automated external defibrillator Feb. 14 during hands-only cardiopulmonary resuscitation training at Falcon High School in District 49. 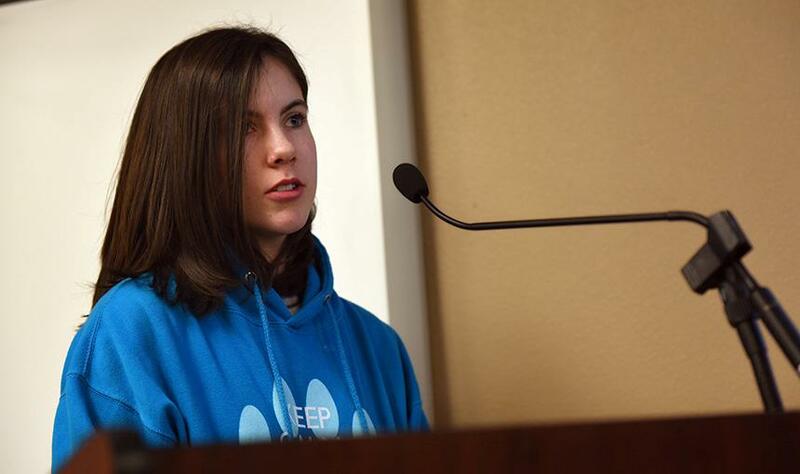 The CPR training was part of student-led weekend activities, called “Pump It Up Falcon,” which focused on heart health. 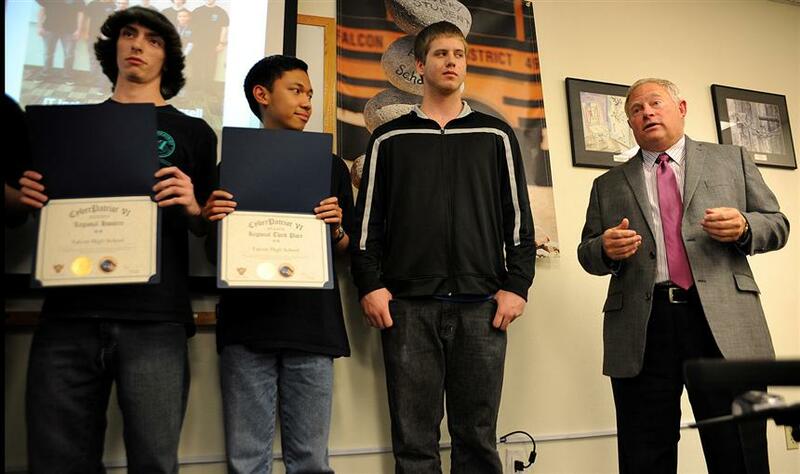 Dave Shiller, president of the Air Force Association Lance P. Sijan Chapter, recognizes Falcon High School CyberPatriot students for their state placements during a Board of Education meeting May 8 in Falcon School District 49. 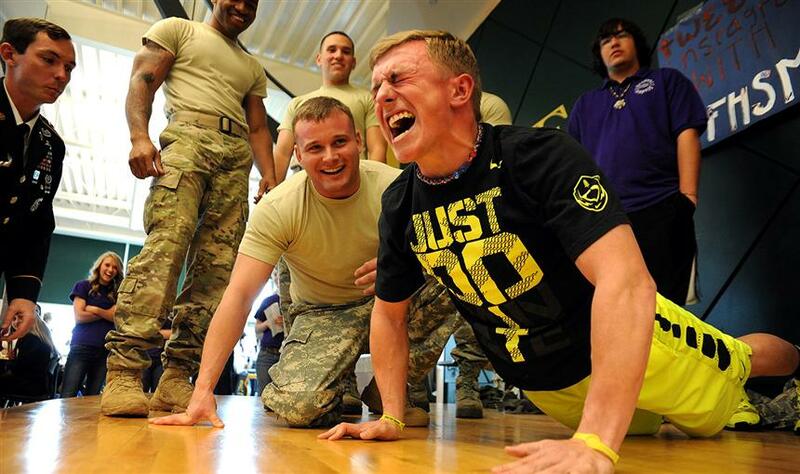 Eleventh grader Austin Worbington, 17, finishes 124 pushups, while motivated by Staff Sgt. 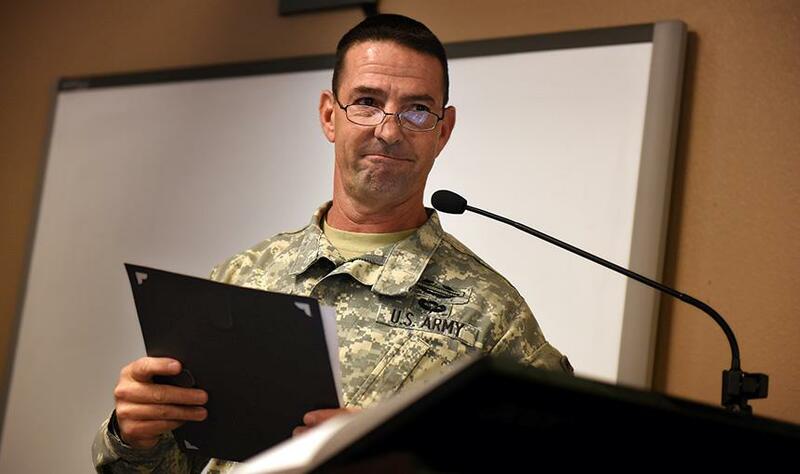 Bobby Martin, a combat engineer assigned to the Colorado Springs Recruiting Company, along with several soldiers from 10th Special Forces Group at Fort Carson, during Month of the Military Child activities April 17 at Falcon High School in Falcon School District 49. 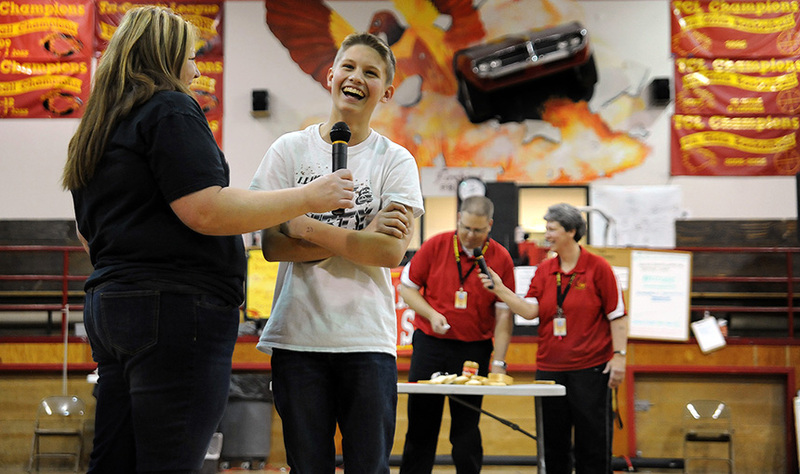 Seventh grader Tyler Weeda, 13, blindly guides principal Brian Smith in compiling a peanut butter and jelly sandwich during a motivational assembly Feb. 28, 2014, at Falcon Middle School in Falcon School District 49.